The days are warming up and the sun has been peaking out to bring some bright, cheerful days to the Pacific Northwest. 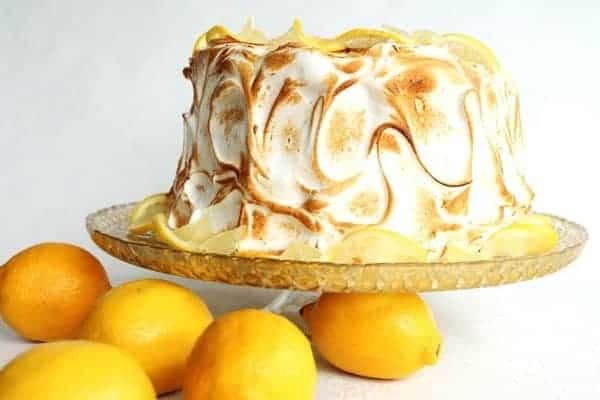 I say this just as I see the weather forecast predicts a cloudy weekend, however, the past few sunny days has me thinking about this radiant, lemony cake. By far, the star of this cake is the lemon curd. 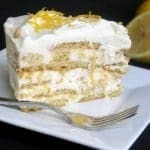 It is rich, zesty, and truly lemony. The secret to the richness of this lemon curd is to use egg yolks instead of whole eggs. 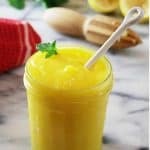 I have made lemon curd using whole eggs in an attempt to minimize waste, however, it simply does not hold a candle to this recipe. It really is worth finding something to do with the leftover egg whites. Half of the egg whites can be used in the Italian Meringue frosting which is a divine, billowy, marshmallowy, fluff of deliciousness. The other half? 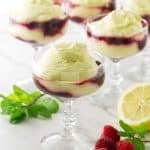 Well, maybe an egg white scramble for breakfast because you will want to save some calories for this delectable dessert later in the day. 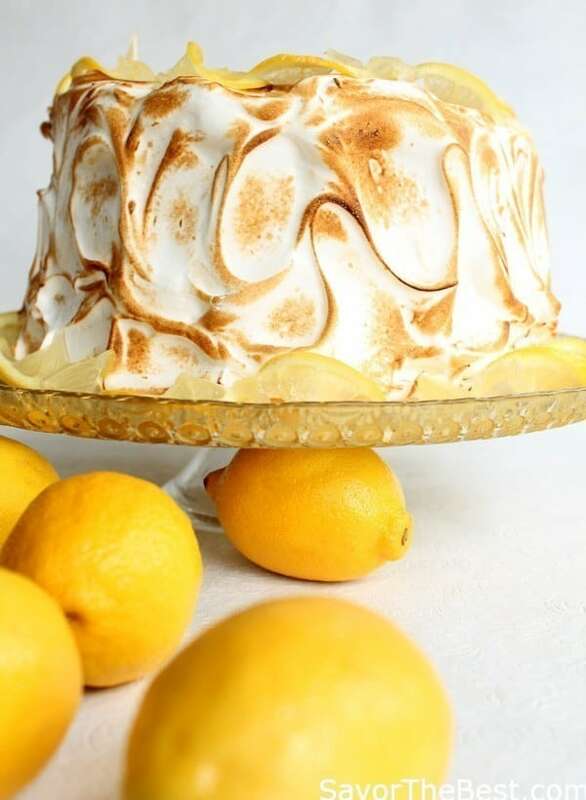 A three layer sponge cake filled with lemon curd and frosted with a billowy Italian Meringue. Heat oven to 350°. Grease 3 eight-inch cake pans with butter and line them with parchment paper. Sift the flour, baking powder, and salt in a small bowl and set aside. Place the milk and butter in a saucepan, heat over medium-high heat to melt the butter. Bring the milk and butter to a bowl then reduce the heat to low to keep it warm while preparing the rest of the ingredients. Rinse a mixing bowl with hot water to warm the bowl up then dry it (the warm temperature will maximize the volume faster) Place the eggs in the bowl and begin whipping on high speed until frothy. Slowly add the sugar and continue to whip the eggs for 8 to 10 minutes until they have tripled in volume. The mixture will turn pale yellow and fall in a ribbon-like pattern when the beater is lifted. Turn the mixer to low and slowly add the vanilla and hot milk mixture. Add the dry ingredients and mix on low until just incorporated. Pour evenly into the prepared cake pans and bake for 25 to 35 minutes or until a toothpick inserted in the middle comes out clean. In a large saucepan, beat the yolks, sugar and butter with an electric mixer until blended well then add the lemon juice and salt. Cook slowly over medium low heat stirring constantly until thick enough to coat the back of a spoon (if you have a candy thermometer, the mixture should be between 192° and 195°). Be patient and do not allow the mixture to boil or it will curdle, the process will take 12 to 15 minutes. Once thickened, pour the mixture into a strainer set over a bowl and discard any cooked egg bits that may be left in the strainer. Stir in the lemon zest, cover with plastic wrap and refrigerate. The mixture will thicken more once chilled. place all the ingredients in a saucepan and bring to a boil then set aside to cool. 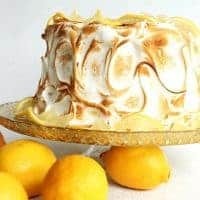 *Make the Italian Meringue Frosting only after the rest of the cake components are made and the cake is ready to assemble. In a small saucepan, combine the sugar and water and bring to a boil. Allow to cook without stirring until the mixture reaches 248° on a candy thermometer. Meanwhile, place the egg whites in a clean mixing bowl and whisk until stiff peaks form. Drizzle each of the sponge cakes with the lemon syrup. Place one of the cakes on a cake plate then spread half of the chilled lemon curd on the first layer of cake. 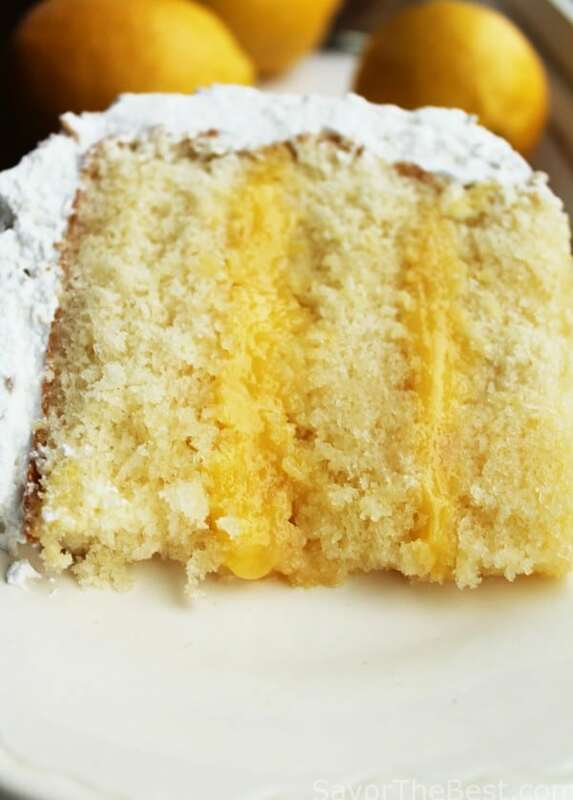 Top the lemon curd layer with a second cake and spread the rest of the lemon curd on it then place the last sponge cake on top. Spread the Italian Meringue Frosting onto the top and sides of the caked. Use the back of a spoon to create dips and mounds in the frosting. 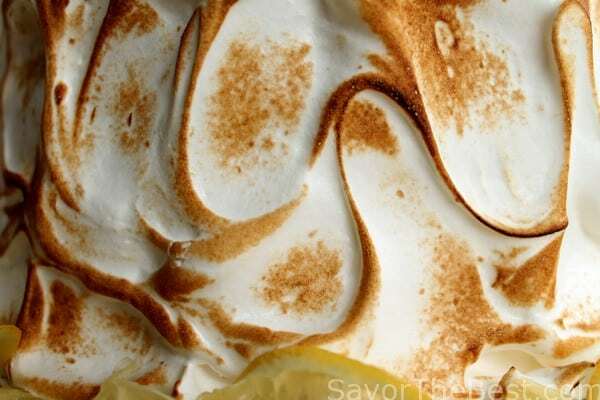 Use a brulee torch to brown and caramelize the peaks of the meringue frosting. I love the meringue on the outside! Oh man you are killing me! How am I supposed to get these next 10 pounds off if you keep posting this stuff 🙂 This looks sooooo good!